The term “day trading” assumes that a trader opens and closes positions within a single trading session and doesn’t take positions overnight. Also, when talking about day trading, people generally think of instruments such as – equities, ETFs and futures. Not options. However, let’s analyze whether we can use options for day trading and, if so, we should consider how to adjust trading styles and which nuances to focus on while trading options within such a short time frame. Volatility is required to allow a trader to catch a relatively large price move. Certainly, we could say that volatility may be “scaled” if an instrument can be traded with leverage, but in this article, we consider non-leveraged trading. Liquidity is required to allow a trader close his position at any moment with a tight bid/ask spread. When analyzing liquidity level, we must take into account the size which we trade. If we trade only one contract, then liquidity is not an issue in most of the instruments you might want to trade. Besides the quantity of contracts which you can buy/sell in any given moment, an important metric is the size of the spread between best market orders. You pay half of the spread to the market each time when buying/selling at market price. Commissions is not only an instrument property as it mostly depends on your broker/FCM. The only requirement is that commissions must not kill a significant part of your profit. Now let’s take a look at whether options satisfy these requirements. The heading above is a bit misleading for anyone who knows something about the implied volatility concept. This paragraph is not about IV/HV of an option’s underlying instrument; it is about the volatility of the option’s price itself. Here we are considering options not as a derivative, but as an independent security. To start, let’s take three options on the S&P 500 futures index, which are being traded at the moment of writing this article. We consider three options, one is at-the-money, and two (call and put) are out of the money. For each of the options, we build a candlestick chart for daily prices from the beginning of the instrument’s lifecycle to the current day. We can see on the chart that price movements are significant, sometimes moving more than 100% in one day. The day was selected randomly, 2016-11-22. It’s easy to see that the price range of the put option for this day was between 22 and 27.5 points or more than 20%. 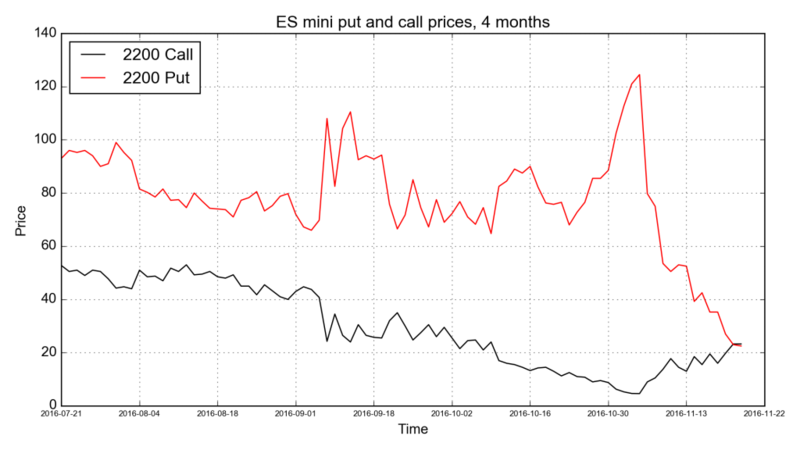 In other words, the option’s price changed significantly more than the underlying’s. Therefore, options price volatility is more than enough to allow traders to use them as a speculative security for day trading. The charts above were built for option strikes which now are at the money. If an option is far in or out of the money, then it’s price will not be so volatile. Liquidity of a single option is always lower than the liquidity of its underlying. There are several reasons for this. The number of options is bigger than the number of underlyings by thousands of times. For example, right now (when this article was written) there are 6 options series for the ES mini December futures. Each series contains about 400 options. Even if we assume that the number of people who trade options is equal to the number of people trading futures (the underlying), their interest is dispersed on all the different options. The further the strike is from the money, the less liquidity exists at that strike. If we open a big position in an ATM option, we must remember that it might become harder to close that position if the underlying price changes significantly causing the option to be far in or out of the money. We want to understand at which strikes the most trades are concentrated. The best way to visualize such kind of information is a histogram. We’ve built two: the first shows a distribution of the number of trades, while the second illustrates a distribution of the number of traded contracts. 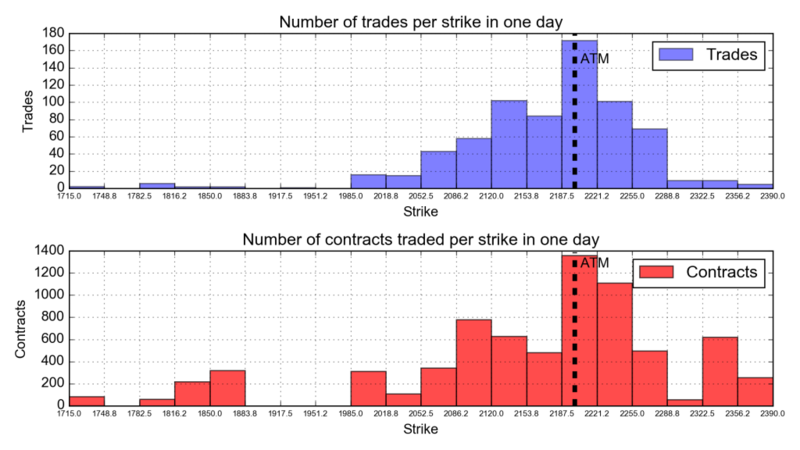 As expected, most trades occurred near the ATM strike. The black dashed line on both charts denotes current underlying price. But since we are talking about intraday trading, it’s not likely that the liquidity of a particular contract will change significantly in one day. What really can affect the performance of intraday options trading is the bid/ask spread. 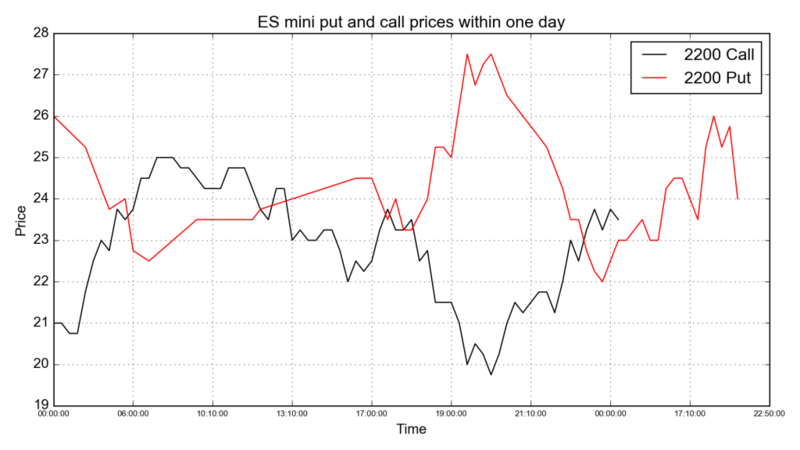 Let’s compare the spread of the underlying (ESZ16 futures) with that of the corresponding ATM call option. Right now the spread in ESZ16 futures orders book is 0.25 or 12.5 $ and this is equal to the minimum price step, denoted in contract specification. Contract nominal value at current price is 2200/0.25*12.5 = $110,000. The spread in futures then is equal to 12.5/110000 = 0.011%. On the other hand, the current price of an ATM call for this futures contract with expiration in two weeks is about 16 points. Price step of this contract is also 0.25 = 12.5$. Spread can’t be less than the price step. Thus minimum bid/ask spread is 0.25/16 = 1.56%, which is huge in comparison to the spread for its underlying futures contract. Commissions are mostly a property of the brokerage firm, not the contract. In our understanding, commissions must be at least smaller than half of the contract’s price step.